December 2018 – Korea Electric Power Research Institute (KEPRI), the R&D arm of KEPCO in Korea, purchased the on-line TSAT/VSAT/SSAT license for implementation of an on-line Wind Security Assessment Tool (WSAT) system for the Jeju island power system. October 2018 – Coordinador Eléctrico Nacional, the organization in charge of coordinating the operation of the national electric system of Chile, purchased PSAT/TSAT/TRI of the DSAToolsTM package to perform Co-Simulation studies using TSAT and RTDS®. 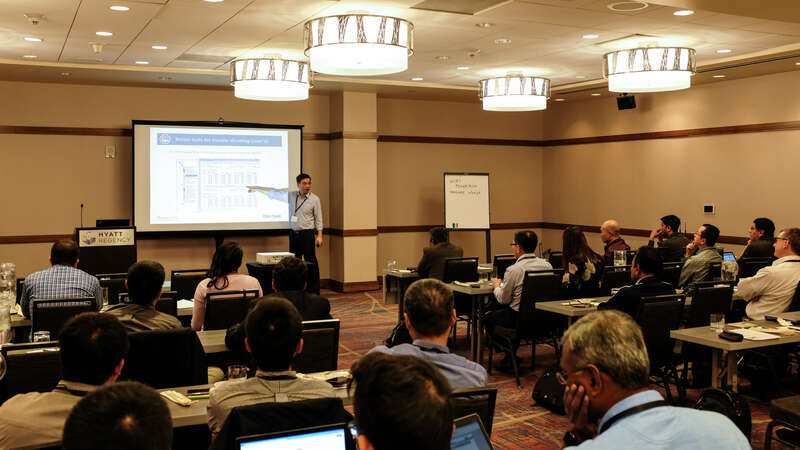 September 2018 – The 2018 DSATools user group meeting was held in Denver, Colorado, on September 27 and 28. The recently-released DSATools version 18 was demoed at the meeting, followed by presentations and discussions focused on various application areas of DSATools. After the UGM, the attendees toured the control center of Peak RC where DSATools is used for on-line Transient Security Assessment. September 2018 – New York Power Authority (NYPA), the largest state public power organization in the United States, purchased PSAT/TSAT/TRI of the DSAToolsTM package to perform Co-Simulation studies using TSAT and RTDS®. September 2018 – Powertech is proud to announce the release of the TRI (TSAT/RTDS Interface) module that enables real-time hybrid simulations to be carried out simultaneously in TSAT (to capture electromechanical transients) and RTDS (to capture electromagnetic transients). TRI is a joint development by Powertech and KEPCO. With TRI, a large scale power grid model of up to thousands of buses can be simulated in real-time by using TSAT and RTDS with a flexible hardware configuration. Please click to read more. May 2018 – PacifiCorp purchased PSAT/TSAT of the DSATools package for the stability model development and validation as well as stability analysis of its power system. PacifiCorp is one of the US west coast’s leading utilities, serving approximately 1.9 million customers in six states. May 2018 – PEACE, a consulting firm based in Texas USA, leased the SSAT module of the DSATools package for its consulting business. May 2018 – Korea Power Exchange (KPX), the power grid and market operator in Korea, purchased the SSR add-on module of the DSATools package for the subsynchronous resonance analysis of the Korea power system. May 2018 – Korea Electric Power Research Institute (KEPRI), the R&D arm of KEPCO in Korea, purchased the ePMU/CDT/SSR add-on modules of the DSATools package for various analysis of the Korea power system. March 2018 – As MISO started using DSATools for its system planning and operation studies, its members also opted for DSATools for the similar studies. Recently, six utilities in the MISO footprint joined the PSAT/TSAT user family: Indianapolis Power & Light Company, Great River Energy, Montana Dakota Utilities Co., Otter Tail Power Company, Basin Electric Power Cooperative, WAPA-UGP. February 2018 – Administrador Del Mercado Mayorista (AMM), Guatemala, purchased VSAT for analysis of voltage stability for its power system. AMM is the major utility company in Guatemala. January 2018 – IGMC (Iran) purchased an on-line TSAT license for implementation of an on-line TSA system for its power grid. IGMC is the management company for the Iranian power grid. December 2017 – ISO New England, one of the major ISO in North America, purchased the SSR software module for analysis of subsynchronous resonance. November 2017 – PEAK RC purchased the ePMU add-on module for use in power system analysis. Working with the TSAT tool, ePMU is able to generate simulated PMU signals compliant to IEEE C37.118 for use in a variety of applications such as model validation, testing of PMU apps, operator training, etc. 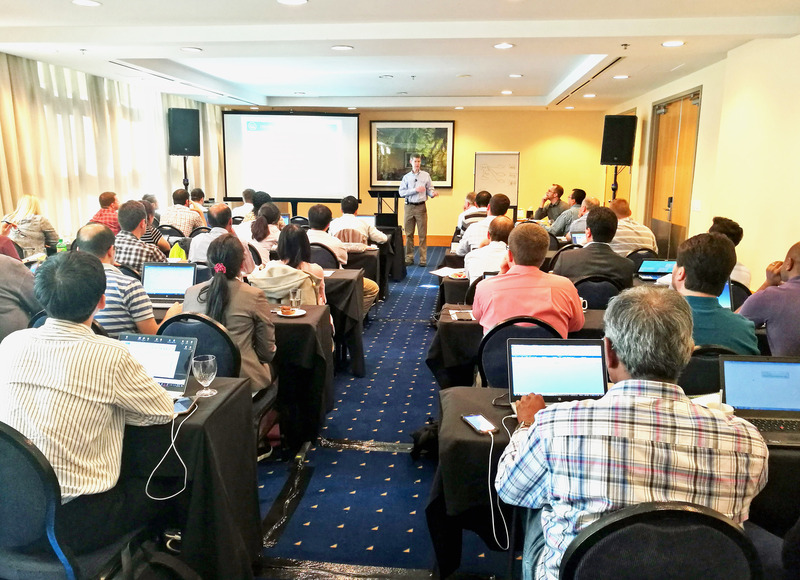 September 2017 – The 2017 DSATools user group meeting was held in Vancouver BC, Canada, on September 28 and 29. This year’s UGM was attended by 44 users representing 25 companies. The recently-released DSATools version 17 was demoed at the meeting, followed by presentations and discussions focused on various application areas of DSATools. After the UGM, the attendees toured the control center of BC Hydro where DSATools is used for on-line stability analysis & control. August 2017 – in a paper presented at the 2017 IEEE PES general meeting, Mid-continent ISO (MISO) shows the success and benefits of the online TSAT system implemented at MISO, including annual savings of US$31 million due to reduced transmission congestion cost. Please see the full story here. April 2017 – Elering (Estonia) purchased an on-line VSAT license for implementation of an on-line VSA system for its power grid. Elering is an independent electricity and gas transmission system operator in Estonia with main task to ensure high-quality energy supply to Estonian consumers. April 2017 – Southwest Power Pool, Inc. (SPP) purchased an on-line VSAT license for implementation of an on-line VSA system for its power grid. SPP, with headquarter in Little Rock, Arkansas, USA, is one of the Independent System Operators (ISO) in North America overseeing the bulk electric grid and wholesale power market in the central United States on behalf of a diverse group of utilities and transmission companies in 14 states. March 2017 – Mitsubishi Electric Power Products, Inc. (MEPPI), a major OEM for power equipment with office in Warrendale, Pennsylvania, USA, purchased the TSAT software. December 2016 – GEIRI North America, Inc., a research institute with office in Santa Clara CA, purchased the PSAT/TSAT/SSAT tools. December 2016 – BBA Inc. an energy consulting company with office in Vancouver BC, Canada, purchased the PSAT tool for its consulting work. December 2016 – Inner Mongolia Power Company, China, has implemented a wind security assessment system (WSAT), based on Powertech’s DSATools software. This system is used to assess the maximum wind power that can be transferred securely from the massive wind farms in Inner Mongolia to load centers. This project was implemented with our partner Beijing TsingSoft Technology Co., Ltd.
November 2016 – Built on the success of the Dynamic Security Assessment System (DSAS) installed as a real-time app in the control center at Korea Power Exchange (KPX), KPX ordered a second DSAS for use with its Dispatcher Training Simulator (DTS). November 2016 – East China EPRI, at testing and research institute located in Shanghai China, purchased the DSATools package. October 2016 – PSE S.A. the Polish TSO, purchased the TSAT and SSAT tools for use in analysis of its power system. July 2016 – The North American Electric Reliability Corporation (NERC) purchased DSATools for use in power system analysis. July 2016 – The Eastern Interconnection Reliability Assessment Group (ERAG) leased the system dynamics database (SDDB) for the development of annual Eastern US/Canada Interconnection base cases for use in power system planning. SDDB is a database tool developed by Powertech for managing dynamics models across multiple regions. May 2016 – Mid-continent ISO (MISO) expansion planning group is now using TSAT for its planning studies. This helped MISO achieve great study efficiency with a manpower saving of more than 50% compared with the previous tool used. Please see more details here. April 2016 – DSATools™ Version 16, including all core and add-on modules, has now been released. This new version of the popular power system analysis software incorporates major enhancements in terms of modeling, features, and usability. Please visit our Downloads page to see the new features and enhancements available in this version. If you are already licensed for DSATools™ programs and want to upgrade, or if you want to get more information about the features and functions available in DSATools Version 16, please contact us. April 2016 – ISO New England has deployed an online VSA system, based on Powertech’s VSAT software, in its control room for production use. April 2016 – Northern Indiana Public Service Company (NIPSCO) purchased an on-line TSAT license for implementation of an on-line TSA system for its power grid. April 2016 – Pacific Gas & Electric (PG&E) company purchased an on-line TSAT and ePMU license for use in its advanced Dispatcher Training Simulator (DTS). January 2016 – ISO New England, one of the major ISO in North America, purchased the ePMU software module for generation of simulated PMU data. ISO New England will use ePMU in a variety of applications. January 2016 – ERCOT, one of the major ISO in North America, purchased the ePMU software module for generation of simulated PMU data. ERCOT will use ePMU in a variety of applications including the Dispatcher Training Simulator (DTS). January 2016 – Ente Operador Regional (EOR), El Salvador purchased the DSATools package for analysis of its power system. EOR is the power grid operator in El Salvador. September 2015 – The 2015 DSATools user group meeting was held in Valley Forge, PA, on September 17 and 18. This year’s UGM was attended by 50 users from 6 countries, representing 24 companies. The recently-released DSATools version 15 was demoed at the meeting, followed by presentations and discussions focused on various application areas of DSATools. After the UGM, the attendees toured the control center of PJM where DSATools is used for on-line stability analysis & control. July 2015 – Northern Indiana Public Service Company (NIPSCO) purchased an on-line VSAT license for implementation of an on-line VSA system for its power grid. NIPSCO, with headquarters in Merrillville IN, is one of the seven energy distribution companies of NiSource Inc. NIPSCO is the largest natural gas distribution company, and the second largest electric distribution company, in the state of Indiana, USA. June 2015 – ESKOM purchased an on-line VSAT and TSAT license for implementation of an on-line VSA/TSA system for the South Africa power grid. ESKOM is a South African electricity public utility and the largest producer of electricity in Africa. May 2015 – DSATools™ Version 15, including all core and add-on modules, has now been released. This new version of the popular power system analysis software incorporates major enhancements in terms of modeling, features, and usability. If you are already licensed for DSATools™ programs and want to upgrade, or if you want to get more information about the features and functions available in DSATools Version 15, please contact us. March 2015 – Siemens PTI Canada leased TSAT and SSAT that will be used for its consulting projects. February 2015 – Administrador Del Mercado Mayorista (AMM), Guatemala purchased PSAT/TSAT/SSAT/CDT for analysis of low frequency oscillations. AMM is the major utility company in Guatemala running its power grid. January 2015 – The MWEX (Minnesota Wisconsin Export) limits in MISO are now determined using online DSA system as of January 6, 2015. The online DSA system, including VSAT and TSAT software from Powertech, has been implemented at MISO for several years for the stability assessment of the MISO system and also for the determination of the transfer limits at its critical interfaces to ensure system security. January 2015 – Dominion Virginia Power purchased SSAT and the newly released SSR programs for the analysis of sub-synchronous resonances in its power grid. Dominion Virginia Power is one of US’s largest producers and transporters of energy, with a portfolio of approximately 26,500 megawatts of generation. December 2014 – Powertech, in partner with ABB, has won the project to implement an on-line voltage and transient security assessment system at Transelectric, Ecuador. August 2014 – Lawrence Livermore National Laboratory (LLNL) purchased the TSAT program for use in its research projects. LLNL is one of the national laboratories operated under US DOE, and is located in Livermore, California. August 2014 – Duke Energy purchased the TSAT/SSAT programs for use in engineering analysis, including the design and tuning of power system stabilizers for its generators. Duke Energy is headquartered in Charlotte, North Carolina, and is the largest electric power holding company in the United States. August 2014 – The Guangzhou Power Supply Bureau in the Guangdong province of China purchased DSATools for use in analysis of its electric power grid that supplies power to Guangzhou, one of the major cities in China. July 2014 – Powertech, in partner with Alstom Grid, has won the project to implement an on-line voltage and transient security assessment system at the National Grid Saudi Arabia. April 2014 – DSATools Version 14, including PSAT, VSAT, TSAT, SSAT and CDT is now released. This new version of the popular power system analysis software incorporates major enhancements in terms of the modeling, features, and usability. If you are already licensed for any of the DSATools programs and want to get updates, or if you want to get more information about the features and functions available in DSATools Version 14, please contact us. April 2014 – The Online Stability Analysis (OSA) system installed at National Grid UK was approved ready for live service on April 15, 2014. This represents a major milestone for the OSA system since the project initiation in 2011. OSA is an on-line dynamic security assessment system based on the TSAT and DSA Manager modules in Powertech’s DSATools package. April 2014 – ISO New England has awarded its on-line VSA project to Powertech. This system will be based on the VSAT program and will be developed in partnership with Alstom Grid. ISO New England is a regional transmission organization (RTO), serving Connecticut, Maine, Massachusetts, New Hampshire, Rhode Island and Vermont. ISO New England meets the electricity demands of the region’s economy and people by fulfilling three primary responsibilities: ensuring the day-to-day reliable operation of New England’s bulk power generation and transmission system, overseeing and ensuring the fair administration of the region’s wholesale electricity markets, and managing comprehensive, regional planning processes. April 2014 – ITC Transmission has awarded its on-line VSA project to Powertech. This system will be based on the VSAT and DSA Manager modules in Powertech’s DSATools package. ITC Transmission is a subsidiary of ITC Holdings Corp., the largest independent electricity transmission company in the US, operating high-voltage transmission systems in Michigan’s Lower Peninsula and portions of Iowa, Minnesota, Illinois, Missouri and Kansas. February 2014 – The National Research Council (NRC) of Canada purchased DSATools for its research related to smart grid development. NRC is the Government of Canada’s premier research and technology organization (RTO). Working with clients and partners, NRC provides innovation support, strategic research, scientific and technical services. January 2014 – The Electrical Power Research Institute of China Southern Grid (CSGEPRI) purchased DSATools for use in analysis of the electric power grid in southern China. China Southern Grid operates the interconnected power system covering five provinces in southern China. October 2013 – The Transient Stability Analysis & Control (TSA&C) system installed at PJM went into real-time control operation on June 1, 2013. This represents a major milestone for the TSA&C system since its initial deployment at PJM in 2012. TSA&C is an on-line dynamic security assessment system based on the TSAT and DSA Manager modules in Powertech’s DSATools package. October 2013 – Manitoba Hydro has awarded its on-line VSA project to Powertech. This system will be based on the VSAT program and will be developed in partnership with Alstom Grid. Manitoba Hydro is a Crown Corporation and the major energy utility in the province of Manitoba, Canada. October 2013 – ITC Transmission purchased the TSAT program for use in analysis of its transmission system. ITC Transmission is a subsidiary of ITC Holdings Corp., the largest independent electricity transmission company in the US, operating high-voltage transmission systems in Michigan’s Lower Peninsula and portions of Iowa, Minnesota, Illinois, Missouri and Kansas. October 2013 – New York Power Authority (NYPA) purchased the SSAT program for use in analysis of its power grid. NYPA, based in White Plains, NY, is a public benefit corporation in New York State, and the largest state-owned power organization in the United States. July 2013 – Western Electricity Coordinating Council (WECC) purchased Powertech’s Small Signal Analysis Tool (SSAT) for analysis of its power grid consisting of all or portions of the 14 western states in US, plus the provinces of Alberta and British Columbia in Canada and the northern portion of Baja California in Mexico. July 2013 – VI Consulting, a consulting company in Malaysia, purchased DSATools for use in its consulting business.